I was starting to sense a little self sabotage. Why is it after a day of feasting that I chose to eat German cuisine, which have such meaty substantial portions. I didn’t think that I was that full after our late lunch reservation at Dinner By Heston Blumenthal but after ordering all the bread/crumbed starters that I wanted to try at Hofbräuhaus, I was starting to test the limits of my stomach trying to fit in my main. Like all good things in Melbourne, Hofbräuhaus is tucked down a little laneway near China town. Inside the Hofbrahaus is warm and inviting. Lots of large tables celebrating occasions or just indulging in the enormous sizes of beer that they serve, while a live band plays in the background which adds to the European tavern feel. My friend ordered one litre of beer, that is possibly why he struggled to finish his main. Langosch Haus-made freshly baked and fried garlic bread, sprinkled with sea salt ($9.50). I would have loved some cheese sprinkled on top but they were still very moreish and were quickly devoured. Gebackener camembert crumbed baked Camembert cheese served with lingonberry compote ($14.50). You have to enjoy this while it is hot. Bretzel freshly baked Bavarian pretzel served with butter ($5.50). Kasekrainer traditional kranksy filled with cheese ($25.50). I love cheese kranksy and this was a good one! Even though I was very full, it didn’t stop me from finishing it with the help of TimmyC. Rindergoulasch traditional Hungarian-style beef stew on haus-made German egg noodles served in an iron pan ($29.50). My friend really enjoyed this, I think if you want a hearty meal without the huge chunks of meat, this is the meal for you. Knuspriger schweinbauch oven roasted crispy pork belly on braised red cabbage, served with bread dumpling, bier jus and apple compote ($39.50). Schweinshax’n huge Bavarian pickled roasted pork knuckle on a bed of sauerkraut and mashed potatoes with haus-made pork jus and German mustard ($43.50). A gigantic pork knuckle with all the trimmings. My friend didn’t finish this but he made a large dent. Bratwurst the classic world famous German pork sausage ($25.50). I really enjoyed the casual warm atmosphere of Hofbräuhaus and it was conveniently located in the city. There are a lot of places in eat in Melbourne but if you feel like German food, I would recommend coming here. This is really to serve as a reminder for me to make this, but hopefully it inspires you too! shenANNAgans is so talented, go check out her blog. When it comes to eating Asian food in Sydney CBD, I foolishly thought I knew it all. I keep tabs on whenever a new ramen place opens up, I keep an eye out for new dessert crazes and I’m all over dumplings like ants on a toffee apple. So when my friend wanted to take me to a place for bao, I was sceptical about this random bar but remained hopeful because I love a good bao. Goodgod is an underground bar located just past World Square towards China town and I would have walked past a million times without realising it and you may have too. Belly baos is the food side of things and they have a line which is separate from the Goodgod bar, which will mean you need to divide and conquer between you and your friends. The Goodgod drinks menu. Cherry Melon Pop freshly juiced watermelon and green apple popped sweet with Fee Brothers Cherry Bitters ($9.00). Goodgod have an interesting list of alcoholic mixed drinks in jugs with funny quirky names but the non-drinkers don’t miss out because they also do several non-alcoholic quenchers both in jug and single cup sizes. This tasted like watermelon juice with a cherry aftertaste that was borderline medicinal. We get there insanely early but we are headed for Russell Peters later on at Olympic Park so we wanted somewhere close and fast. The place was quiet but that meant no lines and fast service. I looked at the menu and realised that I could easily eat everything if I didn’t squeeze in that delicious fried chicken snack, so I conservatively order only four baos to share between TimmyC and myself. Belly Bao’s bao menu, what would you have chosen? Mmmm baos! Soft Shell crab watercress, chilli aioli and lemon vinaigrette ($7.50). We started off with the soft shell crab and in hindsight it was probably for the best as it was my least favourite. The flavours were nice but there was just a sad small piece of crab off to one side of the bun and I just didn’t think the filling to bun ratio was right. Panko crumbed chicken breast lettuce, pickled radish, secret sauce, coriander and chilli aioli ($6.50). I had a bite of my friend’s panko chicken and it was temperature hot, crispy and the chilli aioli gives in a nice chilli kick; definitely worth ordering! Slow braised pork belly pickled mustard greens, coriander, crushed peanut and kewpie mayo ($6.50). I had food envy while a friend was eating his bao; he enjoyed it so much that he ordered another and after he finished eating it, he had food regrets and probably didn’t need that extra bao. Strawbelly bao golden fried bao with vanilla ice cream, fresh strawberry slices, drizzled with condensed milk ($6.50). How cute is the name? I was so caught up with the fact that there was dessert bao that I didn’t notice until friends pointed it out. This sounded good in theory but it was hard to eat without cutlery or a million wet wipes. TimmyC enjoyed the strawberries and ice-cream more while the Asian part of me really enjoyed the bao and condensed milk because it reminded me of fried mantou. There wasn’t that many strawberries and we probably should have gone with the ‘baonana split’ (golden fried bao with vanilla ice cream, fresh banana slices, salted peanuts, drizzled with Nutella) for a more decadent dessert. The baos here might seem expensive by Sydney standards but for these Canberrans they were a steal (our bao prices are $9 each). The baos themselves were all soft, smooth and pat-a-licious (Michelle and Eileen know what I’m talking about). Pulled pork free range pork slow cooked with a light BBQ sauce with a blob of sour cream ($8.00 small). This would probably surprise a lot of people that I chose this dish but when you’re at the Hamlet, you want to try as much as possible so a no/low carb option would pair nicely with let’s say… A huge hot dog from Brod Dogs and maybe also a papa from Mr. Papa. 🙂 (Yes YummyLummy, we also went to Frugii afterwards). This is how much I nibbled until TimmyC finally came back with more food. At first I couldn’t decide what I wanted between the pulled pork and the pulled lamb but the lovely ladies from BurraBerkshires told me that the pulled pork is better in their opinion which took the guess work out of deciding. There were a lot of sides and I thought we had to choose one to go with the meal but no, you get ALL of them! That’s right; you get rice, citrus cous cous, chick peas with grilled zucchini and feta, spinach and rocket salad and a summer salad. They were all really good, I didn’t get bored because there was so much variety in one meal and yes that pork was very delicious and went well with all that sauce. I, like everyone else didn’t read the sign properly. You get ALL of the sides which is good because they all sound fabulous and delicious. This is the menu, what would you have chosen? A close up of the pulled pork. It was very tender, juicy and it just paired so well with sour cream. I was slightly embarrassed that while I was instamming (yes I have a problem), one of the ladies from inside the grass carpeted van came out and hand delivered my meal as I sat right outside at the closest table. I thought that was just a lovely touch and they seemed so friendly. After looking around, I realised that BurraBerkshires was the only one not selling things in a roll/bun/doughy pizza base/wrap. So if you’re looking for good food with variety or just something light and flavoursome to go with something else, I would definitely recommend coming here. 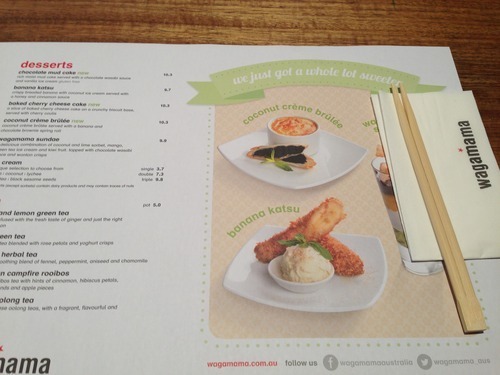 Who hasn’t been to Wagamama, so you’re probably wondering why I came here. During their most recent newsletter my eyes widened with excitement when I read that they were bringing pork ramen to the menu. It was probably more for the Winter months but better late than never, on a bright Spring day I take Timmy out for a bowl of noodles. 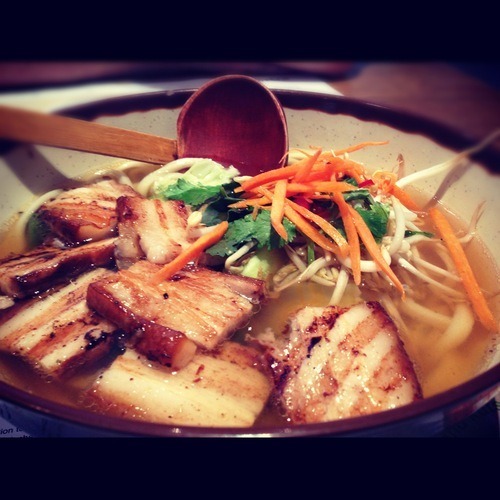 Pork belly ramen– udon noodles in a soup topped with grilled low cooked pork belly and seasonal greens, garnished with beansprouts, coriander, mint, basil, chilli and carrots ($19.90). I must say I didn’t read much past pork belly, but I thought ‘pork belly ramen’ would actually use ramen noodles and not udon. The soup wasn’t thick and rich but more of a salty consomme. As a ‘ramen’ it was unauthentic but as a bowl of noodles everything went well together and the pork was fatty and delicious.